We’d love your help. Let us know what’s wrong with this preview of Christmas at Rosie Hopkins' Sweetshop by Jenny Colgan. To ask other readers questions about Christmas at Rosie Hopkins' Sweetshop, please sign up. Rosie Hopkins is looking forward to Christmas in the little Derbyshire village of Lipton, buried under a thick blanket of snow. Her sweetshop is festooned with striped candy canes, large tempting piles of Turkish Delight, crinkling selection boxes and happy, sticky children. She's going to be spending it with her boyfriend, Stephen, and her family, flying in from Australia. She can't wait. But when a tragedy strikes at the heart of their little community, all of Rosie's plans for the future seem Rosie Hopkins is looking forward to Christmas in the little Derbyshire village of Lipton, buried under a thick blanket of snow. Her sweetshop is festooned with striped candy canes, large tempting piles of Turkish Delight, crinkling selection boxes and happy, sticky children. She's going to be spending it with her boyfriend, Stephen, and her family, flying in from Australia. She can't wait. But when a tragedy strikes at the heart of their little community, all of Rosie's plans for the future seem to be blown apart. Can she build a life in Lipton? And is what's best for the sweetshop also what's best for Rosie? I didn't read part one but I will now! I enjoy Jenny Colgan's characters and the stories she gives them. This book was fun and a little heartbreaking at the same time. It didn't get me in the Christmas spirit but that's okay! This is the fifth in my #12daysofChristmas read-a-thon! Each day I will post a review of a Christmas / Winter related book. Hopefully this will give you some Xmas-Inspo and give your holiday reading a boost! I read the Rosie Hopkins’ Sweetshop of Dream about a year or so ago, in the mood for some syrupy small town romantic storytelling. In the original, Jenny Colgan delivered. However for me the sequel left much to be desired. I felt like Rosie’s character got stuck here; her obsession with marr This is the fifth in my #12daysofChristmas read-a-thon! Each day I will post a review of a Christmas / Winter related book. Hopefully this will give you some Xmas-Inspo and give your holiday reading a boost! I felt like Rosie’s character got stuck here; her obsession with marrying Stephen (who she has been with for a mere year) was dull in its repetitiveness. I also was surprised by the characterization of Stephen – prickly in a dry and humorous way in the original, he seemed like a completely different man in this festive sequel. Some of this change could be put to the positive changes in his personal life (aka his relationship with Rosie) – however I occasionally missed his dark humour. I would have preferred this sequel to focus on Lilian, to be honest, as I felt her story was far more interesting and worthy of an entire book and Rosie’s own. However I can’t fault Colgan for her Christmas vibe – there was snow, carol singing and lots of sweets! Drama was also well written – a particularly dark event occurs about a third of the way through, giving Colgan the chance to stretch her writing muscles and portray something more than just the same romantic comedy tropes which were exhausted within the first few chapters. 5*s for pure enjoyment. I don't know what it is about Jenny Colgan's books but they are such a joy to read. Last year I read Rosie Hopkins' Sweetshop and became so attached to the characters and charming village. I definitely recommend reading the books in order. I've already put an order for the 3rd book, The Christmas Surprise to read over the holidays. OK, I'm going to be totally honest with you, I'm really confused when it comes to Jenny Colgan and her series. The titles seem so similar to each other to me and, yes, I adore the books, but I really lose my touch with who is who and what I've already read and what not. I have already started reading "The Christmas Surprise" about Rosie and after some sentences I realized that something is wrong, and yes, there was something wrong, I haven't read "Christmas at Rosie Hopkins' Sweetshop" yet, so I OK, I'm going to be totally honest with you, I'm really confused when it comes to Jenny Colgan and her series. The titles seem so similar to each other to me and, yes, I adore the books, but I really lose my touch with who is who and what I've already read and what not. I have already started reading "The Christmas Surprise" about Rosie and after some sentences I realized that something is wrong, and yes, there was something wrong, I haven't read "Christmas at Rosie Hopkins' Sweetshop" yet, so I quickly changed the books to read it in the right order. Thank you Jenny for summarizing your stories at the beginning and for reminding us what happened in the previous book - it really helps a lot, what with my memory like a sieve and with reading so many books. I guess this book could be read as a stand - alone although I would recommend to read the series in the right order, it makes it much more enjoyable and much more clear and understandable. Rosie is happy to spend Christmas in Lipton with Stephen and Lilian, even though it's so cold in their little cottage that the windows are frozen inside. And her family is coming from Australia, too! She wants to tell Stephen about this but before she can, something very tragic happens in Lipton, something that unite all the people and makes all the other problem look very insignificant. I have immediately feel connected to all the characters in the book, from the very first sentence I felt as if I had never left Lipton and its locals. Lipton must be the most perfect place to live in books, really. From the very first word I felt as if I've never left this place and felt re - acquainted with all the characters. Rosie is Rosie, you can't not love her, with her easy - going and laidback attitude, her boyfriend Stephen who can be sometimes grumpy and have problems with telling what bites him at the moment, but nevertheless, is a lovely man. Rosie and Stephen are both so stubborn and they don't talk to each other and I really so wanted to bang their heads together, and I was really, really scared that it's the end of their relationship (although I've already had "The Christmas surprise" on my bookshelf, ekhm), when Rosie was planning her trip to Australia, but they work together so brilliantly! Of course it's a relationship with bumps, with a lot of twists and turns, but this makes it much more realistic and believable. Rosie's quirky Aunt Lilian, to name the few main characters, and all of them are lively, they are popping out of the pages and feel so realistic! Tina and her twins, Doctor Moray, Hetty, Edison and his family, they have all such sharp tongues and they say so funny things, it's unbelievable! It's this kind of dry humour that I totally adore. The characters were really vivid and they didn't felt sorry for themselves. I loved the children in the book, they were all individuals and so brilliantly described, according to their age, which doesn't happen often. Rosie's family adds so much to this story, I loved how they interacted with each other and there was really so much love in the air when they all gathered together. I totally loved this book. I adored it. It was funny, touching, wise and very straightforward, all in one. The characters were larger than life and what made me love this book so much were the characters of course, the storyline and dialogues - the way the characters communicate was the best ever. They one - liners are brilliantly sharp, clever and from time to time they've made me suddenly, totally unexpectedly, snort with laughter. Lilian may be old, but she's still sharp as a knife with an attitude and sharp tongue, sarcastic remarks and I totally adored her laidback approach to life and people. Jenny Colgan has an incredible way with words, she can describe each situation in a very expressive, colourful way, a way that made me felt as if I was there and saw this with my own eyes. The tragedy that is mentioned in the blurb was described in such a way that it felt like in a film, like a freeze - frame and the tension was incredible! It shocked me exactly as it shocked the Liptoners, and the author really did this scene a justice, it felt incredibly real! A big brownie point for solving Lilian and Henry's plot - it was actually the deciding point in my eyes and so much could go wrong there, but Jenny Colgan has mastered it wonderfully. It was not too cheesy, not too pushy, it just sounded very realistic and it really COULD have happened. It was a closure that absolutely took me by surprise and actually smashed my heart and it - although not one of the very main subplots - wrapped the book perfectly up. The descriptions in the book are wonderful, and Jenny Colgan's Christmas is a Christmas that you'd like to have yourself. It's funny, it's warm, it's cosy and comfortable, and full of heart and family. She can make me laugh out loud and in the next moment cry buckets, hitting me unexpectedly with the most poignant scene ever. It's incredible how Jenny can squeeze so many emotions in the book. This book is full of action, it's a fast - paced read that I didn't want to put down for a second. It was a complete joy to read and I am sure you are all going to enjoy this story! Copy received from publisher in exchange for a review. En sød julehistorie og feel-goodbog med mange skønne karaktere i. A cute Christmassy read, but just didn't fill me with as much warmth as other festive books. A few parts made me cringe, such as the scoffing about her trying to make her dog gay by putting a coat on it, or when her sister states that Spiderman isn't for girls. Have we not moved past that? I didn't love this as much as the other books I read so far by the same author, but it was still a good story that I enjoyed all the way through. The characters felt a bit unreal to me, so while I did want to know what happens to them, I just didn't fully click with most of the side characters. I liked the main couple, but their families felt a bit stereotype to me at times. As I also couldn't understand some of Rosie's responses I didn't always feel like I was actually in the story, but like som I didn't love this as much as the other books I read so far by the same author, but it was still a good story that I enjoyed all the way through. The characters felt a bit unreal to me, so while I did want to know what happens to them, I just didn't fully click with most of the side characters. As I also couldn't understand some of Rosie's responses I didn't always feel like I was actually in the story, but like some parts kinda passed me by. I absolutely loved this story. Yet another one from Jenny. This is my 3rd book to read of hers and I am just so in love with her humour. At one point in the book I was crying on one page and then she had me laughing on the next. Easy reading for this festive season 😊 Excited to continue to read all the books Jenny has produced! Oplæser: Vibeke Søllested. Rigtig god og bliver altid glad når det er hende der læser. Dejlig julehistorie - Jenny Colgan er altid god at læse hvis man er til feel-good romaner. Jeg arbejder mig langsomt igennem hendes bøger og bliver altid glad når jeg læser/høre hende. Christmas time is the perfect time for a Jenny Colgan story. I liked the continuation of the characters and the addition of new ones, however obnoxious they were. As always I appreciate the humor and the easy reading. Åhh, hvor var den god. Rørende og romantisk - tårerne har løbet stille ned af mine kinder, mens jeg læste de sidste kapitler. I am a big fan of the charming novels by author Jenny Colgan which are not only filled with wonderfully engaging stories but oftentimes also with delectable recipes for sweet treats. And after getting the opportunity to hear Jenny read from her latest Rosie Hopkins novel at a literary event last month, I became even more excited to get my hands on this installment in the series (or what I hope will become a series, at least). 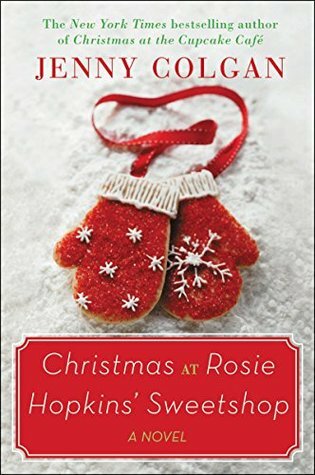 Christmas at Rosie Hopkins' Sweetshop is, predictably, a continuation of the story as found within the pages of Welcome to Rosie Hopkins' Sweetshop of Dreams. Rosie and Stephen unofficially live together while Rosie still manages her aunt's sweetshop in the town of Lipton and Stephen takes up the post of a teacher at the local school. While they are very happy together, their different backgrounds and difficult mothers often make it a trial to make it through the day without a healthy argument or two. But that's okay, as it makes their household very lively and not any less loving as a result. While Rosie is the main character within the novel and I love her to pieces, it were actually the stories of Lilian and Edison this time around that particularly appealed to me and tugged on my heartstrings. I won't go into detail as that may spoil it for those who have yet to pick up the novel, but I can say that on several occasions a heavy lump formed in my throat as I was reading about their emotional and physical struggles. They had to deal with some heartbreaking situations which were portrayed incredibly realistic by the author and made me feel very sorry for them. While I certainly wished things would've gone differently, in Lilian's case in particular, it did make for some page-turning reading. It wasn't all doom and gloom though and I loved having the opportunity to read more about Rosie and Stephen, who are two characters I've grown very fond of after devouring the first novel. The addition of Rosie's extended family made for some particularly hilarious situations this time around and the Christmas setting added some suitably festive sparkle to the already idyllic village of Lipton. Having recently finished Sweetshop of Dreams after it being on my to read list for far too long I knew I had to immediately start this one. I have to say I'm going to struggle to write a review that does this book justice because it was, quite simply, amazing. The cover gives away the idea that this is going to be a sickly sweet Christmassy read however the blurb suggests otherwise. Early on in the book tragedy strikes throwing the whole village into disarray, not only that but Rosie's family ar Having recently finished Sweetshop of Dreams after it being on my to read list for far too long I knew I had to immediately start this one. I have to say I'm going to struggle to write a review that does this book justice because it was, quite simply, amazing. The cover gives away the idea that this is going to be a sickly sweet Christmassy read however the blurb suggests otherwise. Early on in the book tragedy strikes throwing the whole village into disarray, not only that but Rosie's family are coming over from Australia for Christmas so things are hectic from the get go. That said despite the tragedy the book did get me in a Christmas mood and we aren't even in December yet. The whole idea of a cosy little sweetshop in a cosy little village is lovely and I only wish it was real and I could visit it! Luckily over the past few years my city centre has seen an influx in 'ye olde' sweet shops but it does seem that people are still more than happy to settle for mass produced rubbish bought on offer at the supermarket. So when the tragedy potentially means the closure of the sweetshop I found myself really rooting for Rosie and the villagers, well, most of the villagers as the person that was most concerned about the shop and the village was Rosie, who isn't even from the area. All the characters from the previous book are back, Hetty, Tina, Jake, Edison etc and we are introduced to a new character who plays a MAJOR part in the book. I did work out early on what role this character was going to play in the book however! Rosie is also questioning her relationship with Stephen which leads her to wonder whether a move to Australia to be with her family could be just what she needs. Rosie's family certainly added the comedic element to this book as it was quite an emotional read at times. Overall though it is the perfect book to read this Christmas. It can be read as a standalone as there is a recap from Jenny at the start however I think anybody wanting to read this should read Sweetshop of Dreams first, once you get started with it it won't take too long to finish! My last Christmas read for 2014 even tho I finished it just after New Year!!!!!! Well what a boom to finish my christmas reads on and you will not be disappointed in this book . While I was reading this book I felt that I hadn't really finished the first book as all the old characters put in and I was carrying the story on..
life is going smoothly even grumpy old Stephen who won Roise heart in the last book as a job at the primary school and is really enjoying it ,to Lady Lipton dismay she would rather have him running the family business and home Lipton Hall.. now all Rosie would love is a ring on her finger and really settle down as she has roots here now , so when she receives a call from Angie her mother from Oz saying she and her bother and family are coming over to see she couldn't wait but also has to tell Stephen they are coming !!!!! You will just have to read the book find out it shouldn't be missed. I really enjoyed this book. It is a sweet, cosy read which is just perfect for the run-up to the Christmas celebrations. Set in a picturesque village featuring small schools, rolling hills and corner shops. The location screams ideal Winter destination, even with the snowy disruptions. I think that the Rosie Hopkins series are my favourite Jenny Colgan books because it reminds me of my Pembrokeshire home, the positives (the community, the countryside) and the negatives (the gossip, the public tr I really enjoyed this book. It is a sweet, cosy read which is just perfect for the run-up to the Christmas celebrations. Set in a picturesque village featuring small schools, rolling hills and corner shops. The location screams ideal Winter destination, even with the snowy disruptions. I think that the Rosie Hopkins series are my favourite Jenny Colgan books because it reminds me of my Pembrokeshire home, the positives (the community, the countryside) and the negatives (the gossip, the public transport...or lack of it!). After reading Welcome to Rosie Hopkins' Sweet Shop of Dreams, the first installation of Rosie's adventures, I felt that everything had been rounded up nicely at the end of the story. I was a little bit worried that this book had been written purely as a Christmas follow on and that it wouldn't have much of a story line. I imagine that it would have been easy for it to become an 'everything's-great-and-wonderful-merry-Christmas-to-all' sort of book. Thankfully, I was wrong. I won't give too much away but when the blurb says 'a tradgedy' they don't just mean that Rosie runs out of candy canes on Christmas Eve! I had to read that chapter twice because I'd read it so quickly the first time round, too worried about what was going on and what was going to happen. Like Jenny's other cake, chocolate and sweet themed novels there are some wonderful recipies which I'm very much looking forward to trying out over the holidays. Recipes include fudge, candied peanuts and more which are perfect for Christmas time. As always, there was a strong humour throughout the book. There were lots of laugh out loud moments which earned me a few funny looks in the coffee shop but I really enjoy Jenny's humour and it has the ability to really lift some despairing parts of the story. Het verhaal draait hier niet alleen om het leven en de toekomst van Rosie, maar door een dramatisch voorval staat het welzijn van het hele dorp op het spel. Rosie komt met een tijdelijke oplossing. Is dit voldoende? Het lijkt niet zo op het eerste zicht maar dan gebeurt er iets wat alleen in een klein dorp mogelijk is. Komt alles dan toch goed? Dat kan je alleen ontdekken als je het boek leest. Van mij ga je het, hier, alvast niet te weten komen. Ook in dit boek, ontdekte ik 3 foutjes. Een typfout en 2x werd een naam verkeerd gespeld. Jammer, ja een beetje wel maar zolang er mensen aan te pas komen, zal dit gebeuren. Ook redacteuren en proeflezers zijn niet perfect, ook al ben ik er van overtuigd dat ze hun uiterste best doen. Kortom, een verhaal dat in de kerstsfeer past, met ups en downs en waar ruimte gelaten is voor nog een derde deel. It was a sweet (heh) book. I loved reading about the town covered in snow. Mr Dog was especially cute. Of course it had the typical trope of a couple not communicating when it was most important which always frustrates me. Stephen and Rosie really made me smile at the beginning of the book though. Lots of small town drama in this story - but not the annoying gossipy kind, genuine exciting drama! Both families were extremely annoying (except Lilian, Rosie's very old great-aunt, she was brilliant). I think I actually preferred Hetty (Stephen's snobbish mother) to Angie (Rosie's mother, butting in where she needn't and generally just not to my taste at all) & the rest of the Australian bunch. The children's Christmas concert was wonderful. The kids of Lipton were a great part of the story. Especially Edison, a strange but adorable child. So all in all I'd say give it a read if you want to get festive whilst dipping your toe into the "chick-lit" genre. This book was a quick read and was overall I cherry Christmas book. I enjoyed it and would probably read it again during the holidays. The only thing that bugged me a bit was the lack of editing (quotation marks were missing, Hester's name changed to Esther a few times) and the feeling of a few run-on sentences. Well, I should also point out that a few times I got confused during dialogues because I couldn't tell who was saying what, and I had to read through them at least twice, some 3.5 stars. The only thing that bugged me a bit was the lack of editing (quotation marks were missing, Hester's name changed to Esther a few times) and the feeling of a few run-on sentences. Well, I should also point out that a few times I got confused during dialogues because I couldn't tell who was saying what, and I had to read through them at least twice, sometimes. I find with Jenny Colgan that her books are really well written... Until the ending. I feel she has a really good build up/plot but then she seems to make the story drag; until you're bored of it and just want to get to the obvious punch line. On the other hand,I am very fond of Jenny's books and I do really love her writing, but I found particularly with Rosie Hopkin's series I have found the last 80 pages or more to really drag. Lovely book, as always, by Jenny Colgan. I eagerly anticipated reading this after the thoroughly lovely prequel, and I felt so warm and Christmasy when I finished it. We pick up a year after the other one finished, with Rosie and Stephen still together and Lilian in her lovely care home. There is, of course, the usual wonderful feel from the lovely sweetshop and we meet up again with some much loved characters and find out what has happened during the last year. There are, of course, some funny mo Lovely book, as always, by Jenny Colgan. I eagerly anticipated reading this after the thoroughly lovely prequel, and I felt so warm and Christmasy when I finished it. There are, of course, some funny moments and quite sad ones but all in all a great read and I am now in the Christmas spirit, so to speak. I dont know how Jenny Colgan keeps doing it but she does!! Loved every moment of this book from the familiar but lovely characters to the wonderful settings and storyline! Cant wait to read the next book in the series! A lovely sequel to the first Rosie Hopkins book. Great dialogue between Rosie and Stephen, characters you really get involved with, and a beautiful little village you want to live in. This one was not as much about the sweet shop as about the characters and some of their histories. A really fun & light Christmas novel. I think I liked it better than the first Rosie Hopkins book. Enjoyed this. I want my own sweetshop. Jenny Colgan is the author of numerous bestselling novels, including 'The Little Shop of Happy Ever After' and 'Summer at the Little Beach Street Bakery', which are also published by Sphere.' Meet Me at the Cupcake Café' won the 2012 Melissa Nathan Award for Comedy Romance and was a Sunday Times Top Ten bestseller, as was 'Welcome to Rosie Hopkins' Sweetshop of Dreams', which won the RNA Romantic Jenny Colgan is the author of numerous bestselling novels, including 'The Little Shop of Happy Ever After' and 'Summer at the Little Beach Street Bakery', which are also published by Sphere.' Meet Me at the Cupcake Café' won the 2012 Melissa Nathan Award for Comedy Romance and was a Sunday Times Top Ten bestseller, as was 'Welcome to Rosie Hopkins' Sweetshop of Dreams', which won the RNA Romantic Novel of the Year Award 2013. For more about Jenny, visit her website and her Facebook page, or follow her on Twitter.